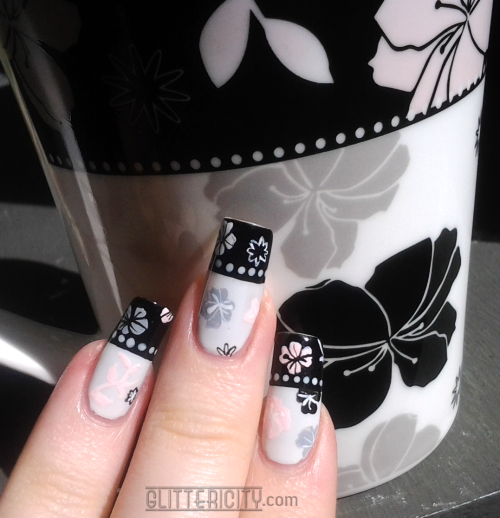 Today I have a mostly black & white design, inspired by my pretty coffee mug! I started with OPI My Boyfriend Scales Walls, the lovely creamy slightly greyish-white which is just perfect for a porcelain look. The tips are Sally Hansen Xtreme Wear Black Out, and then I used a small dotting tool and the same white polish to create the row of dots. So far so good. Then, taking my inspiration from the cup, I used black, white, grey, and pink acrylic paint (mixed up the latter two to match the original as well as I could) and a small detail brush to paint on the flower and vine shapes. Sealed in with KBShimmer Clearly On Top. Outdoors in sun--the difference between the OPI polish and a 'true' white is obvious here, with the white paint there for comparison. I love how it adds to the ceramic sort of effect. I love this! 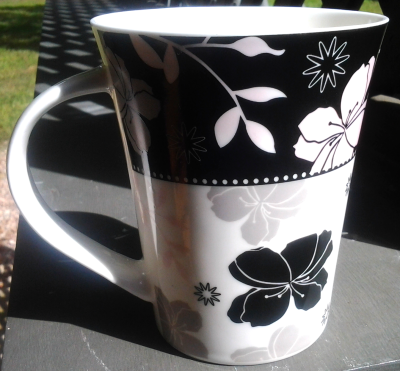 So pretty and you nailed the design perfectly from the cup.